Parking rates are inclusive of all taxes & fees. (Off-Airport lots usually charge advertised rates plus 15%). No Reservations required. For your convenience all parking facilities accept Cash, Visa, MasterCard, Discover and American Express. Jacksonville International Airport (JAX) offers a variety of convenient parking options from covered garage facilities next to the terminal to economy parking for the budget-conscious traveler. Located adjacent to the terminal it is the best option for picking up or dropping off family and friends.Vehicles higher than 7’ cannot be accommodated in this garage. On the first day of parking an incremental rate of $2.00 will be charged for every 30 minutes of parking until the daily maximum is reached. All subsequent days will be charged a flat rate. Located behind the Hourly Garage this is a perfect option for business travelers and those looking for reasonable covered parking close to the terminal. Vehicles higher than 7’cannot be accommodated in this garage. On the first day of parking, an incremental rate of $2.00 will be charged for every 30 minutes of parking until the daily maximum is reached. All subsequent days will be charged a flat rate. The most cost-effective parking option within easy walking distance of the terminal. On the first day of parking, an incremental rate of $2.00 will be charged for every 30 minutes of parking until the daily maximum is reached. All subsequent days will be charged a flat rate. A perfect parking solution for the cost-conscious traveler. Both economy lots have free shuttle service to and from the terminal. Shuttles operate 24/7, approximately every 15 minutes. Vehicles higher than 7’6” cannot be accommodated in Economy Lot #1. Vehicles higher than 10’6” cannot be accommodated in Economy Lot #2. Semi-trucks, trailers, RVs and large box trucks are prohibited from parking in any of the Economy parking areas. This includes any vehicle that occupies more than one parking space. Economy Lot parking will be charged a daily flat rate. No Reservations Required! Simply drop off your car at the Valet Parking booth located curbside on the Departure Level. Look for the Valet signs. Call 904-741-3900 to learn more about JAX Airport Valet Parking. All rates include all taxes and fees. For your convenience all parking facilities accept cash and select credit cards (Visa, MasterCard, AMEX and Discover), except for Economy Lot #2, credit card only, no cash. To make arrangements to leave your vehicle longer than 45 days, please contact SP at 904-741-2277. 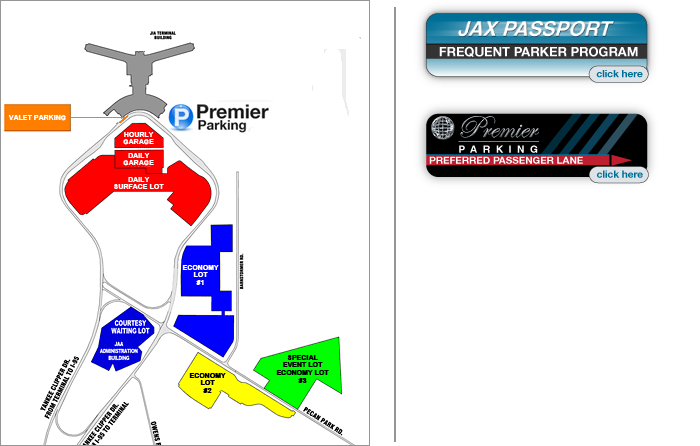 SP is also the correct point-of-contact for additional JAX Airport parking information or questions. Public parking charges WILL APPLY to vehicles parking at JAX public parking facilities that display a disabled parking permit or license tag, except as provided by Florida State Law*. *In accordance with Florida state law, no parking charges will be imposed on any vehicle with specialized equipment, such as ramps, lifts, or foot or hand controls, for use by a person who has a disability or any vehicle displaying the Florida Toll Exemption permit. Effective July 1, 2016, disabled veterans displaying a Florida license plate for Disabled Veterans, issued under Fla. Statute 316.1964, will receive free parking. In addition, the Airport shall grant free parking from other states who have Disabled Veteran (DV)license plates at the JAX Airport. The disabled veteran to whom the license plate was issued must be in the vehicle in order for this exception to apply. Below are representative samples of Florida and Georgia Disabled Veterans license plates and the Florida Toll Exemption Permit. Parking rates are subject to change.